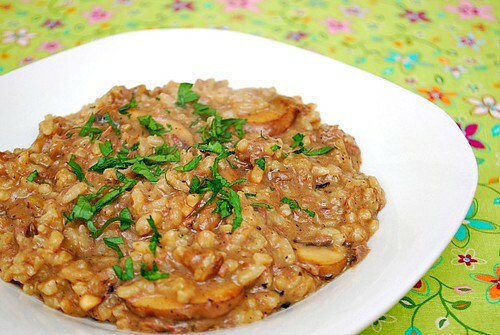 Risotto is one of those dishes I really like because it's naturally gluten free and can serve as a blank canvas for flavors. This Beef Stroganoff Risotto takes the rich flavors of a traditional beef stroganoff that takes risotto to the next level. 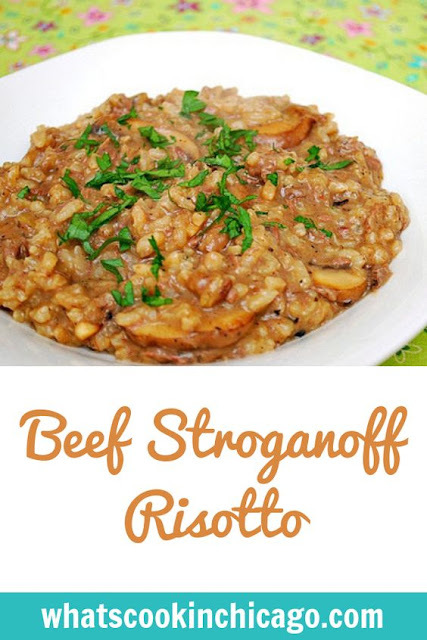 Creamy risotto is full of beefy flavor with caramelized onions and mushrooms, a touch of sour cream and Parmesan cheese to really make it more indulgent. The only caveat is having the patience to make it, but it really is worth the time and effort! I used leftover beef roast that I shredded to really enhance the flavors but ground beef works well too. After making this, I realized I should make risotto and variations of it more often. Joel loves rice so this is a win win for everyone! Preheat a large Dutch oven. If using ground beef, season beef with salt and pepper. Brown ground beef over medium high heat in the Dutch oven but don't over cook. Remove ground beef from pot and transfer to a plate, keeping warm. In the same Dutch oven now empty, add olive oil and saute onions, garlic and mushrooms until softened and caramelized. Add sherry and garlic powder, cooking for another additional 2-3 minutes and scape up any bits on the bottom of the pot. Reduce heat to medium low. Stir in the mushrooms, butter, parmesan cheese and sour cream after all the broth has been used and absorbed. Stir well and allow to cook for 2-3 minutes. Serve immediately and top with parsley. Looks very delicious. Great recipe! floor is generally a good option, to stop carrying a hoover up and down stairs. Unlike air vacuum units, they generally come at about 200 to 350 dollars. it's important that the surface is dry before installing the engineered hard wood floors. Well, if so then, your days of worry appear to finish with the Hoover Max - Extract All-Terrain Carpet Cleaner, F745290. It had basically lost all suction and I was sick and tired of replacing the bag. This is one of those comfort food dishes to me. I'm gonna try it!